Ein wenig verspÃƒÆ’Ã‚Â¤tet Dare #56. Wenn man Dir erzÃƒÆ’Ã‚Â¤hlen wÃƒÆ’Ã‚Â¼rde, daÃƒÆ’Ã…Â¸ Du auf einer einsamen Insel ausgesetzt werden wirst, welches Photo wÃƒÆ’Ã‚Â¼rdest Du mitnehmen? A little bit later Dare #56. If someone told you, you would be stranded on a deserted island, which photo would you take with you? 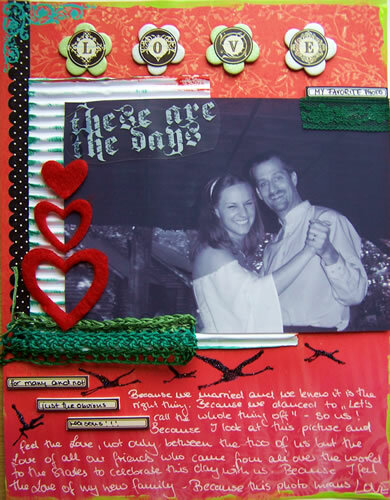 Supplies: Rouge de Garance Papers, Stickles, Hambly RubOns, LilDavis Glitter Chipboard, Creative Imaginations Stickers, 7 Gypsies foam tape and tabs, lace, corrugated cardboard, acrylic paints, self crocheted green thingi, felt hearts. Mensch,schaust Du da glÃƒÆ’Ã‚Â¼cklich aus! Very cool! Loved reading your journaling! Wirklich ein sehr schÃƒÆ’Ã‚Â¶nes Foto und ein wundertolles LO dazu! Nat… your creativity Never ceases to amaze me!!! Beautiful LO Nat, I love this picture!! Thanks for your comment, you are really a sweetie :) Talk to you soon!! ach nat… damit berÃƒÆ’Ã‚Â¼hrst du herzen! traumhaft schÃƒÆ’Ã‚Â¶n..